OTTAWA/TORONTO (Reuters) - Canadian Prime Minister Justin Trudeau remained under pressure over a corruption scandal on Wednesday as a legislator quit his party's caucus and a pre-election budget aimed at swaying key voters appeared to offer too little to stem the tide of negative news. The budget - the last before federal elections in October - lavished new spending on middle-class voters but ignored corporations. It also provided a little for key groups such as millennial voters who backed Trudeau in droves in Canada's 2015 election. The decision by a legislator, who had defended a former minister at the centre of a political scandal, to quit the ruling Liberal Party and sit as an independent dealt a fresh blow to Trudeau's embattled government. The political crisis threatens the government's chances of re-election. Polls have shown that Trudeau's Liberals could lose the vote as the damage from the scandal spreads. The latest defection overshadowed Tuesday's budget which divided money between a large number of new initiatives and left few Canadians satisfied. "It's just too broad," said Norman Levine, managing director at Portfolio Management Corporation. "They wanted to please lots of people and ... when you try to please everybody you end up pleasing nobody, because you spread it too thin." Rob Edel, chief investment officer at Nicola Wealth Management, noted the government did not commit to reducing a budget deficit that is much larger than the Liberals promised. This was "a political rather than an economic decision," he said. The Chartered Professional Accountants of Canada as well as the Canadian Chamber of Commerce complained about the lack of tax reform. But the centre-left Liberals may not care too much as their core supporters are progressive thinkers, women and younger voters. Finance Minister Bill Morneau stressed budget measures to help first-time home buyers, including allowing people to withdraw up to C$35,000 from a retirement savings account. But asked on Wednesday how many younger first-time buyers actually had that much money available, he replied "that will help some people in the middle income range ... not everyone, for sure." The main opposition Conservative Party has relentlessly attacked Trudeau over the SNC-Lavalin affair and described the budget as a bribe. Conservative leader Andrew Scheer has continuously demanded Trudeau's resignation, which some Conservatives privately worry is the wrong approach. Two strategists with deep ties to the party said given the complexity of the affair, and former Justice Minister Jody Wilson-Raybould's statement that no one involved had broken any laws, Canadians would not necessarily agree that Trudeau should quit now. Conservative over-confidence or missteps could be the Liberals' best hope for reversing their slumping poll numbers, pollster Nick Nanos said. On Tuesday, opposition lawmakers delayed Morneau's budget presentation for an hour. 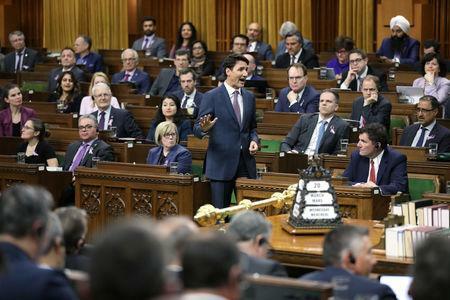 Conservatives initially drowned out his speech in the House of Commons with shouts and jeers and then walked out en masse, a tactic that did not sit well with some Canadians on social media.